I've always liked snails. 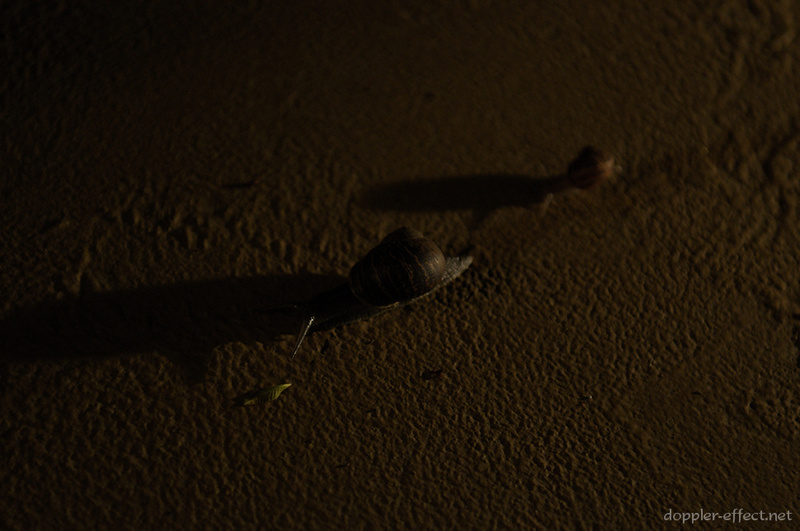 A couple weeks back, it occurred to me to try to show the world from the perspective of a snail, and over the past week I've finally had a chance to make a go of it. It was an interesting challenge to shoot these. For the photo above, I had to wait for the wind to blow the leaves into the right orientation, then lean way into some plants to shoot, using my legs as a counterbalance. 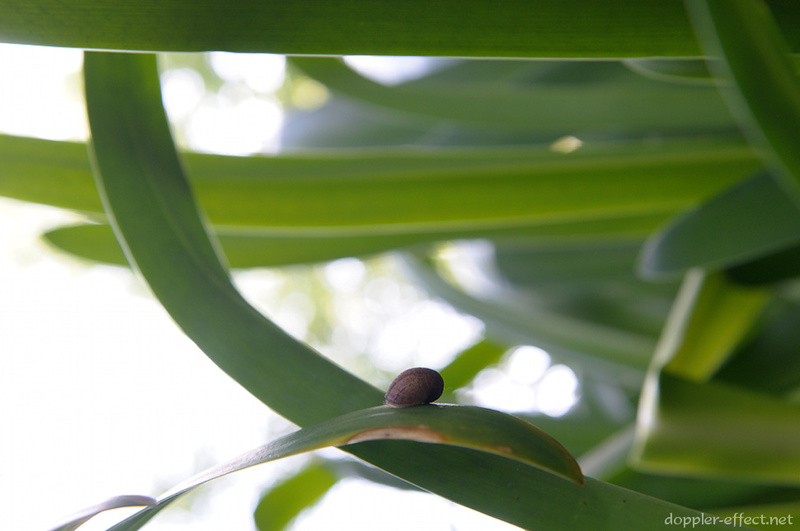 For this photo, I was looking for a snail that was visibly upside-down. 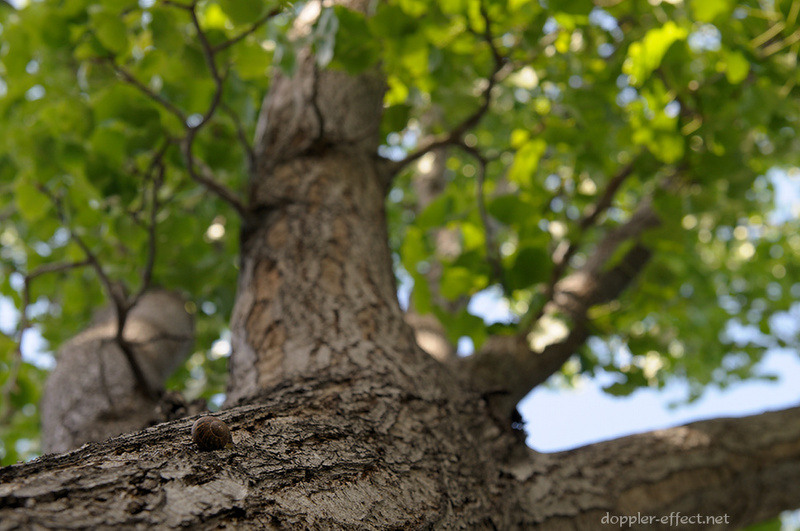 I couldn't quite find one, but I did find this snail climbing up a tree. The snails often come out in force after a good rain, and yesterday was no exception. On the way to work, they were all over the place. Then when I got home, I spotted one and decided to take some more photos. By the time I stuck my bike somewhere and pulled my camera out, I noticed another one in the vicinity. After a few minutes, the two started chugging along (albeit very slowly :o) toward some intersection point on the ground in front of me. As the smaller one passed between me and the small light in the background, the light filtered through its body while simultaneously casting a shadow on the ground. It's really neat that you can easily see parts of the snail's nervous system — note the shadowy bits near the top of the its translucent body. 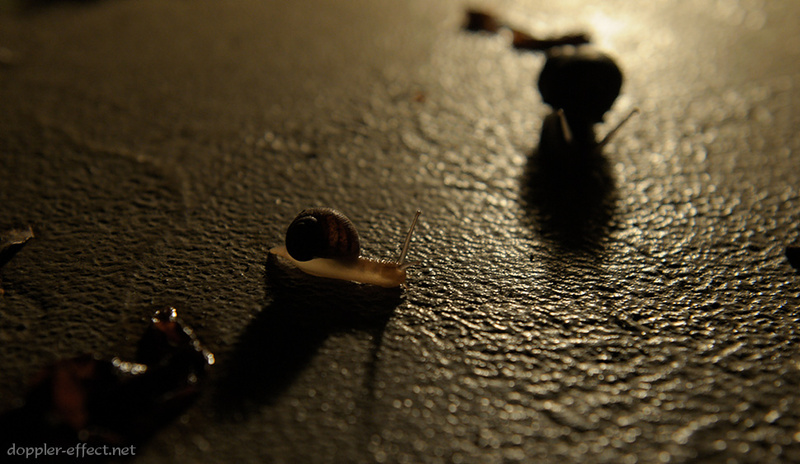 When the two snails met, they touched tentacles and then the smaller one seemed to yield as the larger passed by. They turned in the same direction (toward where I had been kneeling) and turned on the afterburners, so-to-speak. The large one was faster, and as slowly as they seemed to be moving, they were making good progress. I was surprised that I had to pan to keep this 1/15 second exposure sharp.